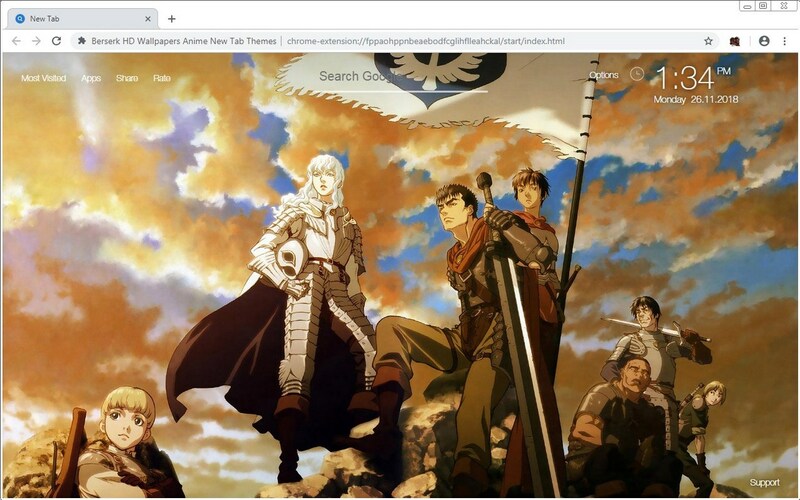 Install my Berserk New Tab Themes and enjoy varied HD wallpapers of Berserk, everytime you open a new tab. ★ What can you get from our Berserk themes? First, you can enjoy a wide range of Berserk wallpapers in HD quality. You can shuffle all pics, or, shuffle your favorite Berserk pics only. You can also select Slideshow option and enjoy a cool screensaver with Berserk wallpapers. And, you can use other free addon themes along with this Berserk new tab. Second, the extension provides quick navigation to your most visited sites, Chrome apps like Gmail, or quick reminder with To-Do List right on the Berserk theme. Date, time and weather forecast can also be shown on Berserk new tab if you need. Finally, you can enjoy all these features (and more will be added on your requests) for free! Our Berserk extension does not include ads or any hidden catch! – Berserk (Japanese: ベルセルク Hepburn: Beruseruku) is a Japanese manga series written and illustrated by Kentaro Miura. Set in a medieval Europe-inspired dark fantasy world, the story centers on the characters of Guts, a lone mercenary, and Griffith, the leader of a mercenary band called the “Band of the Hawk”. Themes of isolation, camaraderie, and the question of whether humanity is fundamentally good or evil pervades the story, as it explores both the best and worst of human nature. Both the manga and anime adaptations are known for their use of graphic violence and sexual content. – Miura premiered a prototype of Berserk in 1988. The actual series began the following year in the now-defunct magazine Monthly Animal House, which was replaced in 1992 by the semimonthly magazine Young Animal, where Berserk continues to be serialized intermittently. The series was adapted into a twenty-five episode anime TV series covering the series’ Golden Age arc by Oriental Light and Magic from October 7, 1997, to March 31, 1998. A trilogy of films, Berserk: The Golden Age Arc, was released beginning in 2012. A second anime TV adaptation was broadcast in 2016 and 2017 for a total of twenty-four episodes.